October 28, 2009, The Boeing 787 Dreamliner a mid-sized, wide-body, twin-engine jet airliner final assembly plant has a new home. Boeing today announced that it has chosen its North Charleston, South Carolina facility as the location for a second final assembly site for the 787 Dreamliner program. Boeing evaluated criteria that were designed to find the final assembly location within the company that would best support the 787 business plan as the program increases production rates. In addition to serving as a location for final assembly of 787 Dreamliners, the facility also will have the capability to support the testing and delivery of the airplanes. "Establishing a second 787 assembly line in Charleston will expand our production capability to meet the market demand for the airplane," said Jim Albaugh, president and CEO of Boeing Commercial Airplanes. "This decision allows us to continue building on the synergies we have established in South Carolina with Boeing Charleston and Global Aeronautica," he said, adding that this move will strengthen the company's competitiveness and sustainability and help it grow for the long term. 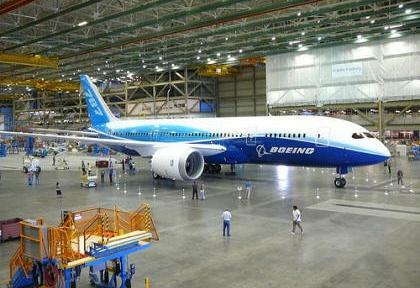 Boeing Charleston performs fabrication, assembly and systems installation for the 787 aft fuselage sections. Across the street, Global Aeronautica, which is 50 percent owned by Boeing, is responsible for joining and integrating 787 fuselage sections from other structural partners. Until the second 787 assembly line is brought on line in North Charleston, Boeing will establish transitional surge capability at its Everett, Wash., location to ensure the successful introduction of the 787-9, the first derivative model of the 787. When the second line in Charleston is up and operating, the surge capability in Everett will be phased out. "We're taking prudent steps to protect the interests of our customers as we introduce the 787-9 and ramp up overall production to 10 twin-aisle 787 jets per month," said Albaugh. "While we welcome the development of this expanded capability at Boeing Charleston, the Puget Sound region is the headquarters of Boeing Commercial Airplanes. Everett will continue to design and produce airplanes, including the 787, and there is tremendous opportunity for our current and future products here," Albaugh emphasized. "We remain committed to Puget Sound."